You are awesome man...With the M113 and Btr60 My wishlist is complete! Sudden thanks for this - look great. I'm trying to get them to work with ALiVE - could you please confirm the Classnames I should use ? I guess SUD_USSR and SUD_NATO but they don't seem to work ? Are you recreating all the maps like Malden on those pictures or they are from another mod? Did all those vehicles before have interiors? Was having some weird stuff happen to the HAFM Mod HMMV Pack so I looked through the configs of yours and theirs. Apparently the Gunner Anims in your pack conflict with theirs. I will try to fix it and send you the fix. It's just a simple fix either you or he can do by adding tags to you the anims in the config file. You don't need to change the rtm but just the ways it's listed in the config. Anything I can do to help I will. This is what happens when porting without applying PhysX parameters to the vehicles. For sure parameters will be tweaked in the future. No. This is a great Malden2010 map, made by Hotzenplotz. It's working with A3MP. Yes they did. I just made them functional. The textures are BIS from Arma2. Maybe sometime later I will make my own. About the steering - I like it, but if there will be many people, who don't, I'll change it. I think this happens because I didn't change animation names from BIS originals and they didn't change it too. We both are lazy. :-))) Will be fixed. I don't think your units work with ALiVE yet... please post in the ALiVE thread and a dev will get you sorted. Just wanted to share some insight as to what I feel would be a great loadout for this mod. To keep this a true to life Cold War mod, I would love for it to have the following loadouts. This comes from me being in the 6th Batt, 502nd Inf Div. Berlin Brigade, circa 1988-1990. If it matters I was C co, and HQ Co.
(Note) everyone who carried a M16 with or without M203 carried 6 mags in pouches and 1 in weapon. Hummv, soft top 4 door, open bed. M113, Mortar, 4.2" mortar in open top deck. These were all common in use weapons and vehicles used during that time period. 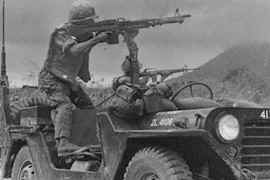 As stated almost everyone who carried a M16a2 it was without M203, it was not common to carry them and was only 1 per squad with 3 squads per platoon, 3 platoons (infantry) per company. Medics only carried a M1911a1, no rifle. was 1 M60 and 1 M249 per squad, 1 M203, other 4 carried M16a2. Normal man squad. 1 medic per platoon, 1 sniper per company. Sniper were solo with no spotter. Sniper carried a M21 and M1911a1. The M21 is a M14 with reddish brown colored fiberglass stock, darker red upper handguard. Scope used was an ART-II. Use of vehicles was rare, M35a2 were primary which were used to transport troops to within 5-8 miles from target area. Heli were rare and only used outside of Berlin. Combat was primary urban terrain, with some woodland. All uniforms were identical which are much like the camo used in this mod. no special hats or beret were used. All units wore Steel Pots (metal helmets circa vietnam) up until 1988 then used early Kevlar helmets (kpots). Snipers wore the same uniforms, but would also from time to time use a ghille suit. Most times just standard woodland BDU. Standard LBE were worn by all but sniper and medic. Most times even the Machine gunner wore them. M249 gunners carried the 2 mag pouches like the regular infantry did, since the M249 can be belt feed via loose or drum, and the M16 mags. Common trick was a suicide mag, which was a 20 round magazine with 30 round spring inside. 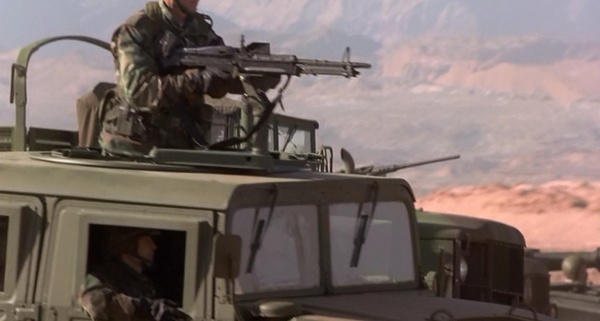 M249 fired up to 1100 rounds a minute when gas cleanout selector was opened, and regular 30 round mags would jam. I could go on and on about this, but if the developers would like to know more, feel free to PM me. I also have a good working knowledge of the weapons are vehicles used by the DDR and USSR during that time period, as we were trained on their usage as well. Some of us had priv to use French, German, and British weapons of that time. At that time the Germans still used G3a3, French Famas, and British L85a1. Later 2 were awesome for CQB. mmmm that sounds good, anything is possible, I wouldnt mind some east germans coupled with that. Sudden, I created a ALiVE compatible config for your groups and added some basic motorized and mechanized groups. a letter to Creative Commons, 444 Castro Street, Suite 900, Mountain View, California, 94041, USA. 2BeefaloBart, this is just priceless!!! Thank you! And what about M2 Bradley? Was it used? 2lukrop, Thanks! Will be added in next update!!! And what about M2 Bradley? Was it used? Pleas do it, even if it wasn t used, I miss it so bad! what about M2 Bradley? Was it used? About HMMWVs still: Could the gunner's animations be improved? Right now he's sticking his head out asking to be shot, its like some parade-stance or something. Always had the same problem with BIS and their gunner animations.. Possibly mentioned before - forgive me I'm mid defence of a FOB. Stolen a BTR 60 off the Syrian attackers and jumped into the Gunners seat.. I noticed the reticule is REALLY small !? Can't use it practically ? That was my intention to make scopes more real in this mod. hmm the field of view + Magnification is perfect, but the reticule (markings) are not visible is that right? (never shot down a BTR, so have no idea :) ) but you cannot see the marking or gradients, ranges etc ? they are very very small and very faint ? Can I ask for a screenshot?